Nollywood actress Genevieve Nnaji is back! ~ CK Jacob: Nigerian Fiction And Lifestyle Blog. Nollywood actress Genevieve Nnaji is back! Are you a fan of Genevieve Nnaji? After two years without a movie, she is back with a new movie which features herself, Oris Erhuero, Majid Michel and others. They say action speaks louder than words. People, fans have criticized her being away for too long. 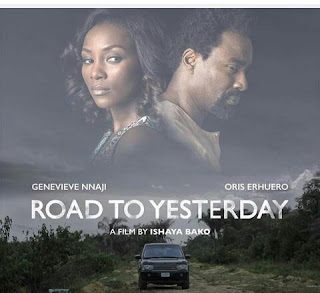 The movie was shot in various parts of Lagos Nigeria, ‘Road to Yesterday’ is an epic love story, about a couple desperate to mend its marriage on a road trip to a relative’s funeral. However when memories and secrets from the past are revealed, a lot more is at stake than their relationship. She is back! I am sure people were surprised to see her in a new movie. I heard she is also one of the producers. I can't wait to watch it. I really hope it is interesting.